Air Pollution: Bad For Health, But Good For Planet? 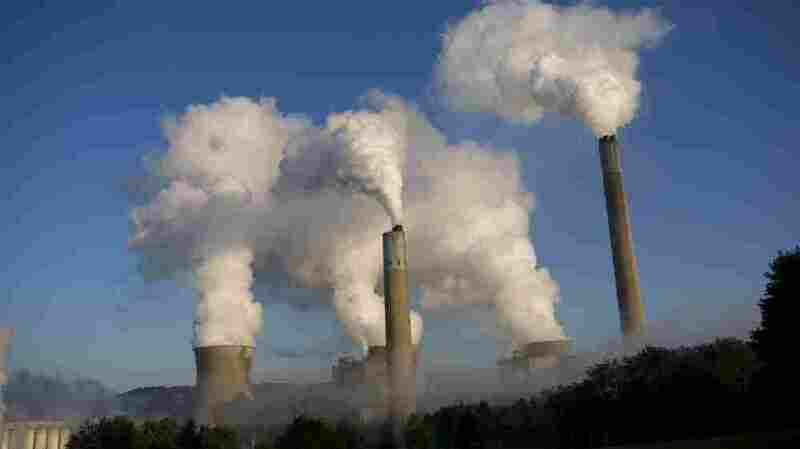 Along with carbon dioxide, power plants spew chemicals like nitrogen and sulfur into the air. Reducing this pollution is good for our lungs — but might actually cause an increase in global warming. "There are so many different kinds of aerosols and they have many different sources," she says. "Some warm and some cool. But in the net, humans are emitting a lot of extra aerosols, and they tend to cool for the most part." The aerosols reflect sunlight back into space, or they stimulate clouds that keep us cool. But it turns out that's not all they do. These aerosols also influence how much carbon dioxide gets drawn out of the air by plants on land and in the sea. "They can add nutrients, for example, to the oceans or to the land," Mahowald says. "But also while they're in the atmosphere they can change the climate, and so that also can impact the amount of carbon the land or the ocean can take up. So there are quite a few different ways that aerosols can interact." In an article published in Science magazine, she concludes that those effects add up to quite a bit. At the moment, aerosols are not only helping reduce global warming by cooling the atmosphere, but they're helping reduce the amount of carbon dioxide that stays in the air once we emit it. That's good news for now — it means the planet isn't heating up quite as fast as it could. But that's bad news looking down the road a little bit. That's because many aerosols make people sick — heart and lung disease in particular. So some nations are now in the process of trying to rein them in. "As we clean up the aerosols, which we really want to do for public health reasons, we are going to be perhaps causing ourselves more trouble in terms of the climate situation," Mahowald says. This is not a brand-new idea. For example, other research has found that switching from coal to much cleaner natural gas might not do much to help with global warming because it would also be reducing the pollutants in coal smoke that help offset warming. Mahowald's results suggest that reducing those pollutants could be an even bigger problem than realized, when you consider that aerosols help remove carbon dioxide from the air by encouraging plant growth. Hard numbers on this effect are highly uncertain at the moment, but this could turn out to be quite significant. "This is something that's really poorly studied, and I think that the main point of the paper is we've been ignoring this potentially important topic," she says. And studying it is not easy because the effects aren't well understood. For example, nitrogen can be a fertilizer, but it can stunt plant growth when nitrogen comes out of the air in acid form. Lisa Emberson at the Stockholm Environment Institute and York University in England, who studies these biological cycles, says there are so many subtle effects it's hard to be sure which ones will prove to be the most important. "I think the take-home message of this paper is we need to understand those interactions far better and we probably need to take action much more quickly than we are doing at the moment," Emberson says. Right now it seems like we're much more likely to clean up aerosol pollution, while increasing the amount of carbon dioxide in the air. So scientists, unfortunately, may have a chance to see how this inadvertent experiment on our planet starts to play out.